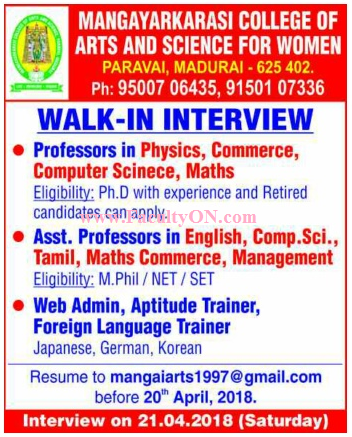 Mangayarkarasi College of Arts and Science for Women, Madurai has advertised in the DINAMALAR newspaper for recruitment of Professor / Assistant Professor Plus Non-Faculty jobs vacancies. Interested and eligible job aspirants are requested to apply on or before 20th April 2018. Check out further more details below. About College: Mangayarkarasi college of Arts and Science was started for women in the year 1997 by founder Amarar Pitchiah Pillai, a great philanthropist and a visionary of the 20th century. It's fabulous campus stands in a pollution free pleasant environment conductive for learning. Our college is accredited by NAAC with “B” Grade during the academic year 2013-2014. Our management is dedicated to education which runs primary to higher secondary schools, B.Ed, D.T.Ed and Engineering colleges. We prepare young women with knowledge, skill and attitude for life of commitment.